I’ve mentioned before on this blog that I’m not typically interested in feminist criticism. When a text actually lends itself to it at all, the resulting analysis is often obvious to the point of being banal: you mean, stuff written decades ago was more overtly sexist than we generally see today? You don’t say. However, when the penultimate level of a video game involves traipsing around what is basically a giant womb, pitting one alpha-female absolutely obsessed with self-reliance against another alpha-female absolutely obsessed with the power of creation, while giant eggs are bursting forth with new life all over the place, well…there might be some feminine symbolism going on there; I could be wrong. This is a roundabout way of saying that some of my thoughts on this level may seem a lot like feminist criticism, and that’s a bit of a pain; I still don’t like it on general principle. It’s just, even a stopped clock is right once a day, you know? You’ve got to pity these creatures who get to live for exactly thirty seconds before Lara pumps them full of Uzi rounds. Just a little. 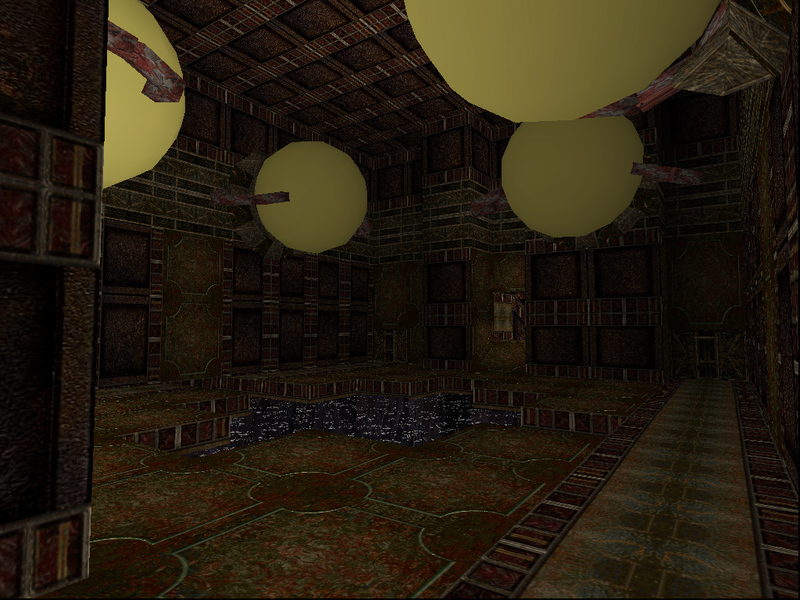 In the penultimate level, we ascend a structure apparently made from functioning organs, complete with pulsating veins and other types of living tissue. A giant central chamber, calling to mind a spinal column, orients us on our journey as we climb. It’s tempting to say that we climb from the womb (the opening area with the six eggs) to the head (the top area with what looks like brains for walls and floors), but we seem to be climbing from the womb to another womb; the largest egg, about to burst with Natla’s largest “child”, lies up top. 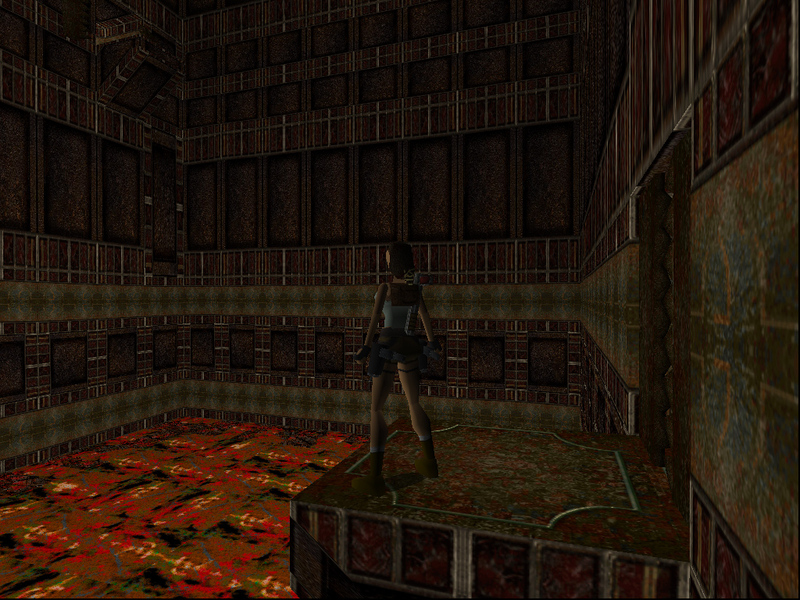 Okay, so it looks like lava here, but there are parts of this level where it looks like blood. You know I’m right. Natla has taken the female power of gestating offspring to a brutal extreme, and it’s up to Lara- more interested in the accomplishments of civilizations long dead than any living creature- to stop her. There’s something a little sad about the fact that our villain loves life far more than our heroine does. It’s not like there’s any doubt that Lara’s the good guy here; we don’t want skinless mutants cavorting on our lawns. However, what Natla ultimately wants is to use competition to make life on earth stronger, something Lara doesn’t care about; she doesn’t want life, and the civilizations it forms, to last forever. She wants them to flourish then die, to create beautiful artifacts for her to seek and deadly ruins for her to explore. This showdown is about longing for eternal life (Natla, who seeks immortality through her creations) and accepting the inevitability of failure and death (Lara, who only really gets interested when everyone in the area has been dead for a thousand years.) Natla’s world of life is disgusting because nature is disgusting- is there anything more freaky looking than childbirth?- while Lara’s world of death is pristine, regal. Ultimately Atlantis, and Tomb Raider in general, is about accepting the inevitability of death because in ephemera, there is beauty. Furthermore, while the idea of a cryogenically frozen alien CEO creating her own master race of Atalantean horseman might be a bit over the top, this level succeeds as such amazing nightmare fuel because it taps into our very real fears for the future of science and bio-engineering in particular. Sure, we’re unlikely to walk into a room filled with chartreuse egg sacs bursting to reveal pterodactyls that shoot magenta fireballs, but what about facilities designed to grow human organs for transplants? What about encountering clones of ourselves, and the nagging question of whether or not they count as people, or just soulless copies? Fortunately for Lara, Natla is absolutely batshit crazy, making the choice to put an end to her hijinks an easy one; it is, at the end of the day, a videogame. We probably won’t be so lucky. The Atalanteans kill me so often it would probably be embarrassing if anyone could see it. The constant Uzi clip pickups are a tacit acknowledgement from the developers that none of this is even the slightest bit fair. This level is tough, maybe even too tough; I’m okay with the fact that the aggressive enemies can kill you really easily if you’re not careful. I’m okay with the fact that the flying enemies can push you off ledges even if you are careful. I’m okay with the fact that everything that isn’t actively trying to kill you just happens to be made of molten lava. I’m okay with the fact that there’re a zillion things in the environment just thirsting for Lara’s blood, and you can’t always tell what the proper way to proceed is until she’s already died at least once. What I am not necessarily okay with is all of these things working in concert to ruin your day simultaneously. Fortunately, smart save crystal placement saves this level from being an extravaganza of broken controllers. Unless you’re fantastic at controlling Lara, you will probably die many, many times here, however there’s just enough save crystals to keep it from being intolerable. This level skirts the line of being too hard to be any fun without quite crossing it, but I might not have been willing to admit that when I died for the umpteenth time on my first playthrough. However, because it’s so hard, it’s that much more satisfying when you finally reach the next save crystal, secure in the knowledge that you are done with the previous section and won’t have to look at it ever again. Starting from our first sight of lava in Natla’s Mines, there are few things in gaming more satisfying than making progress in the last hub of Tomb Raider. Lara and Natla have a real heart-to-heart, which Lara puts a stop to before Natla can offer to become partners and give Lara little red Atalantean wings of her own- which is a shame, because that would have been awesome. I once again implore the custom level wizards to meet me halfway here. Lara! With wings! Make it so! There’s a lot of interesting things about the cutscenes that end this level, the fact that they got away with having Natla use the word “abortions” in 1996 being only one. Another interesting one is the fact that Qualopec and Tihocan are furious at Natla for using her power for what they call “violation;” there are some pretty obvious implications there. We usually think of that as being a male thing, but Natla’s certainly earned it. Some might find Natla’s conversation with Lara annoying, wondering why Natla doesn’t just kill Lara rather than take the time to explain her motivations and plans, Bond-villain style, and I actually have a low-tolerance for Bond-villain stupidity; I’m generally the one shouting at the TV “Why don’t you just shoot him already? !” even when everyone else is okay with it. However, I don’t think Natla taking the time to explain her plans to Lara is stupid in this particular instance, because it fits everything we’ve just learned about Natla. Natla is all about survival of the fittest, and Lara’s just proved that surviving against frankly ridiculous odds is kind of her schtick. With her belief in strength as virtue, Natla has to respect Lara by now, and the whole tone of this scene is a begrudging respect. She treats Lara as an equal at this point because to do otherwise would be to betray her character; the characterization in this game is by no means deep, but it is consistent. 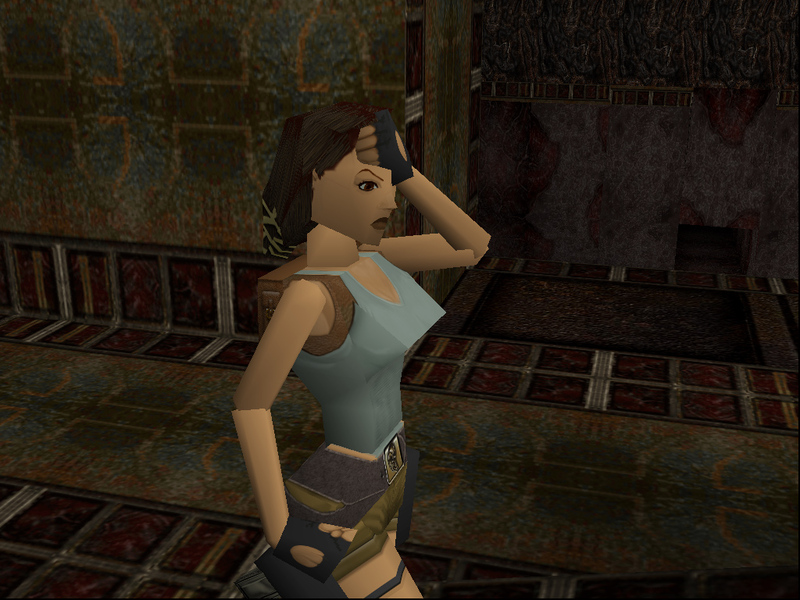 The Lara doppelganger is one of the most memorable moments in the game, and with good reason. In addition to the puzzle of how to dispose of her being just subtle enough that you feel like a genius when you figure it out, but not hard enough to frustrate most players for long at all, conceptually it’s so perfect; Lara kills her evil twin, just as she must do to Natla on the next level, her real opposite. It could just be me, but I think there’s even a brief moment of sorrow when you kill her; if she has any of Lara in her at all, she deserves better than this, doesn’t she? Also notable for introducing the term “Bacon Lara” into the fandom, and there’s something charming about that. If you think of the doppelganger as a skinless mutant with her organs hanging out it’s kind of gross, so how do we ameliorate that image? Pretend she’s just made of savory, delicious bacon! Squint and it almost works. I’m alright with this level being difficult because we’re approaching the end of the game, but that unnecessary switch towards the end of the level that releases a wall of lava is just nasty. It’s a clever idea- exploiting the fact that we automatically pull every switch we see like obedient trained seals- but it’s just too mean. I don’t think there’s any indication that the pulling the level leads to a lava-wall death, and no way to escape once you’ve made that mistake. Or maybe I’m just bitter because I forget about it and die here at least once every time I play through the game. Another one that’s hard to rate because my vast appreciation for the world the developers have created is not matched by my enjoyment while playing. 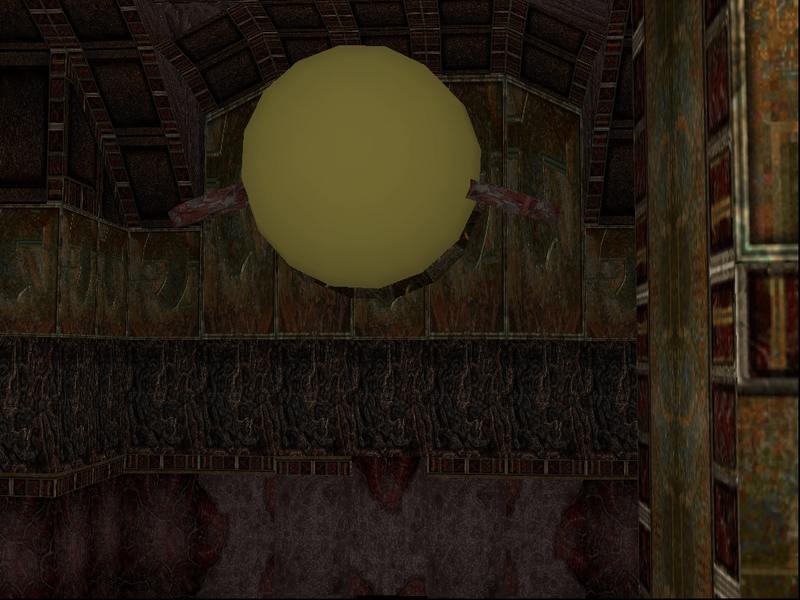 Conceptually this level blows me away, and the fact that they managed to create such a nightmarish world using the graphical capabilities of the PS1 is beyond impressive, but there’s just so many not-entirely-fair ways to die here it hurts the fun quotient. In which giant torsos are dispatched, and Natla is really easy to kill because the real final boss is the environment. Also, I’d like to give a shout out to Tina Von Rotter of Tina Von Rotter Games on Youtube for her Let’s Plays, which I consulted before writing this post. 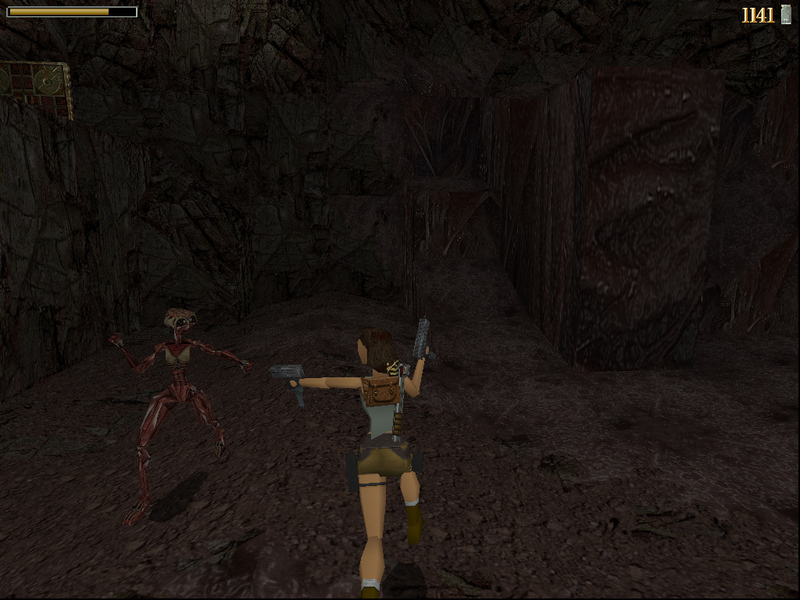 One level to go, and the sheer improbability of the fact that she’s still alive has knocked even Lara for a loop.